Earlier in the year I had an old B-C-E Enterprise set that I assembled (can't say "finished" because I have to put the decals on them). When the movie set came out, I used that to assemble the Refit E. Then the TOS set came out so that's where I got my TOS E. So I pulled out an old TOS/E-A/E-D set and I am in the process of building the Galaxy version. That was my original idea for the contest entry. Then it hit me: What am I going to do with the inaccurate Refit and TOS kits from the set? So I combined the two in my head. My Phase II will not be like the Jeffries in that the nacelle grills will be convex instead of concave. It will be like the rendered picture in that it will have rectangular Bussard Ramscoops instead of the Refit grills plus the TOS deflector dish. I didn't like the rectangular photo torp tubes in the plans or the pig-like snouts of the render. I had also seen a mono-tube on other buildups and drawings that I didn't like. So for the photon torps I decided to create my own. Everything else will be like the plans. Tomorrow I plan to smooth out the engineering section and reshape the bridge superstructure. Last edited by el gato on Mon Jul 01, 2013 12:46 am, edited 1 time in total. Wow, that's quite ambitious. I've seen several phase II ships done with the ertl 22in and the TOS cutaway. I've even seen some done with the 1/1000 kits. But I do not think I've ever seen one done in 2500. I mean those intercoolers you cut out must be tiny. Will you throw some pennies in a few shots for scale tomorrow? lol. Hadn't thought of that, but yeah, I'll add a penny in the next shots. In the next few days I'll be working on the nacelles almost exclusively because I have to figure out how to do the curved grills ("photonic spill ports") plus the rounded housing ends. I think I have the housing figured out by cutting beads into quarters, but the grills.... Man, I've been looking at various plastic thingies hoping to find something that could be suitable. Any suggestions are welcomed. I can do a rounded grill with a decal if I have to but I'd rather have texture. Ambitious Indeed. But utterly fascinating as well. I wish you the best of luck in it's completion. That'll be cool. You may want to check out the Star Trek: Phase II website. They transitioned from TOS to Phase II recently and there is a vignette where 1701 comes out of drydock after the Phase II refit. 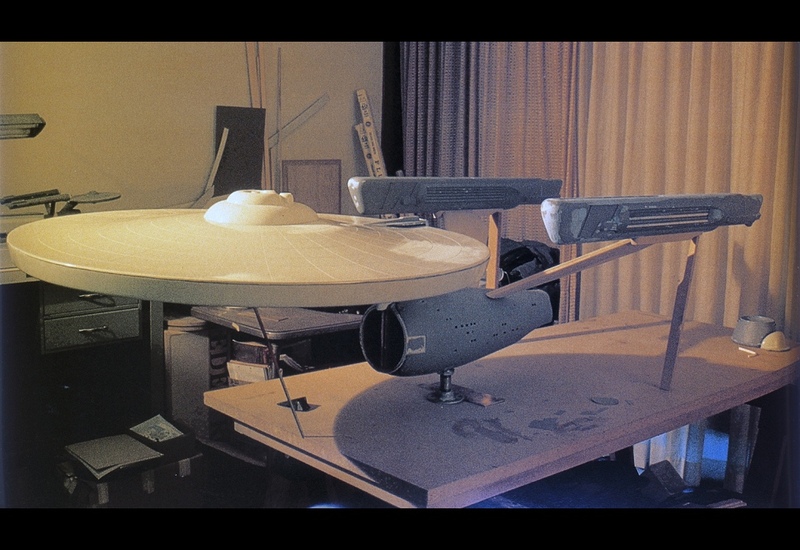 I think their drydock is based on some pre-production art for Phase II or ST:TMP. It might have even been a McQuarrie painting, but I'm not positive. It was the one in the asteroid. DouglasGlenn wrote: That'll be cool. You may want to check out the Star Trek: Phase II website. Yes! Thank you! This is the clip. I saw that scene when it first came out but I forgot where. I liked the look of the rectangular Bussards on the Refit nacelles. But I didn't see that type of Bussard until I found the render I posted earlier. I'm not crazy about the blue glow of the render or the orange glow New Voyages put on the Bussards, so I'm going with good old fashioned red. I forgot to post this last night. Here is a front view picture of the neck mated to the body. I think I got it reasonably straight. It's a bit longer than I wanted, but it was an inadvertently good thing. When I dry fitted the saucer, the neck was sufficient long for the photon torpedoes to clear the lower sensor dome! Moongrim wrote: Ambitious Indeed. But utterly fascinating as well. I wish you the best of luck in it's completion. My eyes water from the strain of imagining the amount of squinting I'd have to do to replicate that fine work.